This fall has been beautiful but, guess what? Winter is just around the corner! For homeowners living in colder climates, the end of Daylight Savings Time is a big “heads up” to prepare for the winter months ahead. Homes need seasonal adjustments and here’s a to-do list of chores that homeowners need to take care of before the cold and snowy weather arrives. The Furnace. Call a contractor to check your furnace to make sure it is working properly. Also, if your system uses furnace filters, make sure to replace the old dirty ones with nice new clean ones for the winter season. Having a furnace check-up now will prevent any nasty “No Heat On A 10 Degree Day” surprises. The Gutters. This one’s a bit tricky. 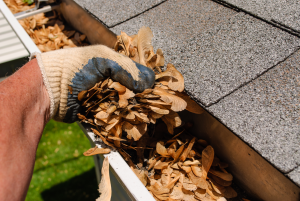 It’s important to clean out your gutters in the fall but don’t do it too soon. Wait until the last of the leaves have fallen so that you can remove ALL of the debris. Clogged gutters cause roof leaks and can lead to ice dams in cold weather. The Chimney. The more you use your fireplace, the more your chimney needs to be swept. Dirty chimneys affect your air quality and can be a fire hazard. So, don’t forget to have your chimneys inspected and swept annually. Water Pipes. No one wants a frozen water pipe so take preventative steps to avoid the problem. Drain outside water pipes and shut them off before the first big freeze. On very cold nights, open cabinets doors underneath sinks to allow warm air to flow through on to the pipes. Windows & Doors. If you have window air conditioning units, take them out and store them until next summer. 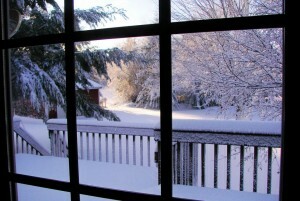 Swap out screens for storm doors and windows. Finally, check windows and doors for drafts. If you feel any drafts, use weather stripping or caulk to keep cold air from getting in. Winterizing is all about keeping the heat in and the cold out. Remember there is nothing nicer on a cold winter day than walking into your warm and cozy home!